Christine Lampard has mastered the art of floaty maternity wear. 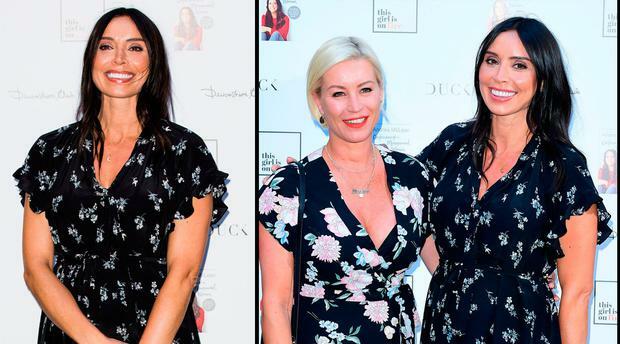 The expectant tv presenter (39), from Co. Down, was one of the guests of honour at a book launch on Tuesday, opting for a floral frilled wrap dress, classic black heels and YSL envelope chain bag in white. The Loose Women panellist revealed in May she was pregnant with her first child with husband Frank Lampard and said she was "excited, nervous and grateful" at the prospect of becoming a mother. In recent weeks, she has developed an even greater social media following for her bump updates and tips on how to maintain her signature chic style during pregnancy. She has continued to devotion to bold colours, light fabrics and embraced patterns, which were previously thought to be maternity style no-nos. Lampard (née Bleakley) said she chose to wait until she was more than four months pregnant to announce the baby news because of nerves. "In that classic kind of anxious, nervous, superstitious way it was like, 'let's get the big scan done and then you can open up and start to tell people', because I've been really nervous," she explained. And she took a number of pregnancy tests before sharing the news with her husband of three years. "I did at least seven or eight [pregnancy tests] over the course of the next few days," she said. Frank has two daughters Luna (12) and Isla (11) from his previous relationship with model Elen Rivas.